Reducing the ecological impact of cane toads on our Australian biodiversity is the main reason we want to control cane toads. How do we achieve that impact reduction? Well, everybody who has set out to deal with the toad problem seems to have focused on how to get rid of toads. But there is another possible approach that has been ignored. Perhaps we can reduce the ecological impact of toads not just by changing toad numbers, but also by changing the native species’ ability to deal with toads? In another page on this website (see OUR NEW IDEAS), we explain TEAM BUFO’s new ideas about controlling cane toads. We think that these ideas will work well, and could be implemented quickly. But regardless of what method we use, let’s just suppose that we DO manage to find a way to kill 95% of the cane toads in the population. Would that be enough to stop the toad invasion, or to save the native fauna in areas that the toads invade? Sadly, no. The first problem is that those large fast-dispersing toads at the front will just keep on moving - so even if 95% of them are killed, the other 5% will keep moving forward. The front-line toads have been modified by evolutionary processes into incredible dispersal machines – no matter what happens, they just keep moving (see our website page on TOAD EVOLUTION). Thus, the toads will continue to sweep westwards, even if we greatly reduce their numbers. And there's another problem. Even if the numbers of toads are much lower, the few that are left will have a major impact. The reason is that unlike frogs, toads are really obvious - they like to sit out in the open, in places where they are easy for predators to find. Perhaps they are "advertising" their poisonous nature - which may work in South America (where predators share a long evolutionary history with toads), but doesn't work in Australia where the local predators just think they have found a particularly large, particularly stupid edible frog. 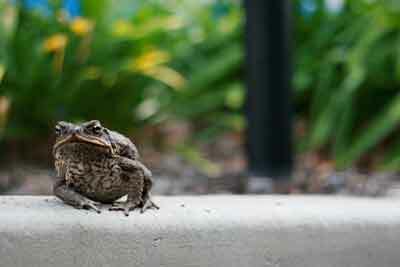 Unlike native frogs, cane toads like to sit out in the open, and are easy for predators to find. So even a few big toads in an area are likely to spell almost certain death for animals like goannas, quolls and king brown snakes - predators that move about over large areas, and are very good at locating prey. Is there anything we can do to save those predators, or do we just have to sit back while thousands of native predators are killed when they encounter large toads at the invasion front? Well, there IS a possible solution - though it may be controversial, and we suspect that we will need to have long and detailed discussions with community groups and wildlife management agencies before we could convince people that it is a good idea. At first sight, it sounds crazy – but here goes. We could introduce SMALL cane toads in advance of the main toad invasion, so that the predator's first encounter is with a tiny toad not a big one. That would give many predators a chance to learn that toads are poisonous - and so, avoid toads from then on. This may sound like it requires a bit more intelligence than we expect from goannas and so forth, but TEAM BUFO’s work has shown remarkably fast learning in many native species. For example, this is true for many fishes (from tiny gudgeons to large barramundi), frogs (including just about every species we've tested) and marsupials (planigales and dunnarts). If the first toad they meet is small, the predator gets sick but usually recovers, and tends to stay away from toads afterwards (see OUR RESPONSES page) - so that by dumping small toads in selected spots in advance of the front, we might give the native predators a much better chance to survive. We wouldn't try to dump small toads everywhere across the landscape - the idea would be to create small pockets of resistance (with "toad-smart" predators), so that after the main toad front arrives there are still some places where the predators survive in reasonable numbers. Those pockets of "toad-smart" animals could eventually recolonise the local landscape. 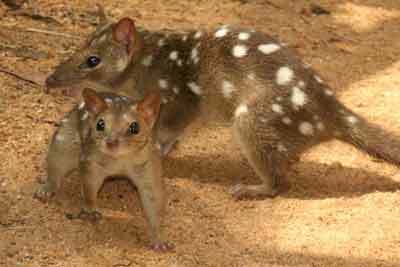 The best way to save predators like these northern quolls may be to teach them to avoid toads- perhaps by exposing them to small toads BEFORE the main invasion front arrives. People are frightened by the idea of releasing small cane toads in advance of the main front, even if the release point is only a few kilometres from the current front, in an area that is certain to be invaded by toads within a few months. We understand this reaction - but if we really want to stop our big predators being killed as the toads sweep across the landscape, releasing small "teacher toads" is probably the only way to do it.